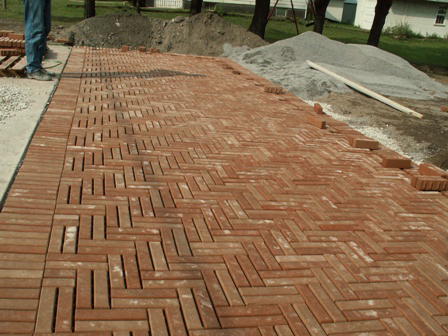 Samples of the fired-clay Permeable Boardwalk Paver are now available. 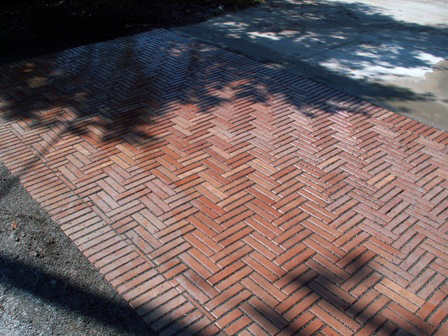 The 2-1/4-inches wide x 9-inches long x 3-inches deep dry-pressed paver is suitable for pedestrian and vehicular traffic and can be installed in several bond patterns including: running bond, basket weave, herringbone and double herringbone. 1 When installed using industry standard best practices. Consult an engineer for hydrology and load-bearing design considerations. 2 Consult the U.S. Green Building Council for credit details. A test plot of Whitacre Greer Permeable Boardwalk Pavers is shown below. The plot simulates a typical crosswalk and is subjected to stopping, starting and turning truck and light vehicular traffic.